For patients with damaged or missing teeth, the doctors at Dentistry at the Heights can design a full mouth reconstruction plan to restore your smile. By combining multiple restorative procedures into a comprehensive treatment plan, our doctors can restore oral function and improve your overall health. Our team uses innovative technology to ensure that your treatment is as comfortable, precise, and efficient as possible. A full mouth reconstruction can rebuild almost any part of your smile, from minor tooth decay to inflamed gums and missing teeth. Is Full Mouth Reconstruction Right for You? While physical trauma can leave patients with cracked or missing teeth, gum disease is one of most common causes for these problems. In order to lay the foundation for a successful reconstruction, any underlying periodontal disease must receive treatment. What Happens during Full Mouth Reconstruction? 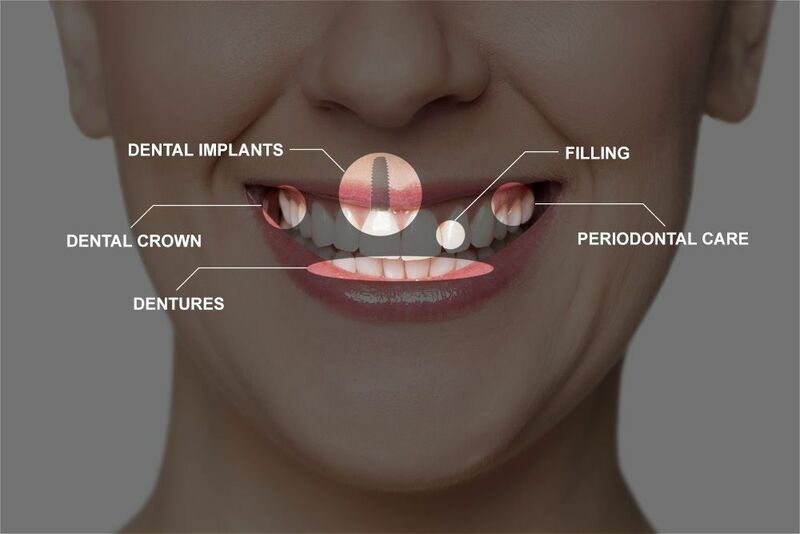 Crowns: Made from lifelike porcelain, crowns fit over a damaged tooth to prevent infection and protect against trauma. Bridges: Anchored by crowns placed on adjacent teeth, bridges can replace between one and three teeth. Dentures: These large prosthetics can restore up to a full arch of teeth. Full mouth reconstructions are an efficient way to fully restore both your oral health and smile. Implants: Made of biocompatible titanium, dental implants are used as artificial tooth roots to stabilize dental prosthetics. Fillings: Made of natural-looking composite material, fillings are the most common treatment for moderate decay. Root canal therapy: By removing infected pulp from a tooth, our dentists can eliminate pain, prevent future reinfection, and restore function. During your initial consultation, one of our doctors will examine your smile and ask a number of questions about your medical history and goals. Based off this discussion, they can determine which treatments are best suited to your needs and budget. Why Choose Us for This Multistage Treatment? Our doctors are committed to providing the most comprehensive care possible. In addition to pursuing continued education, Dr. Kevin Trotter performs all aspects of implant placement onsite so that patients do not need to coordinate multiple appointments with different doctors. All of our treatments are also supplemented with the latest technology. By using CEREC to create same-day restorations and dental lasers to minimize discomfort, we strive to provide the most convenient and comfortable treatment possible. We also provide numerous sedation options for anxious patients. Full mouth reconstructions are an efficient way to fully restore both your oral health and smile. Contact us online or call (347) 492-1018 to set up a consultation with one of our doctors.